Achieve more with the proper tools. Palm Beach Day Academy is committed to keeping pace with technological developments and creating a 21st century learning environment. That means investing in technology and tools that are most useful to faculty and students. Equitable access to technology aids students in becoming information producers rather than information consumers, as well as self-directed learners and collaborative team players. Every classroom on Upper Campus is equipped with either SmartBoards or Flat Screen technology, allowing enhanced interactive instruction for students. Students in Grade 4 enjoy the use of classroom sets of iPads. The school constantly updates its computer labs and is now incorporating 3D printers, science-based Vernier hardware and software, and other technology in the classroom. Teachers attend frequent faculty-led “Appy Hours” to learn how to unlock the potential of their laptops and tablets. 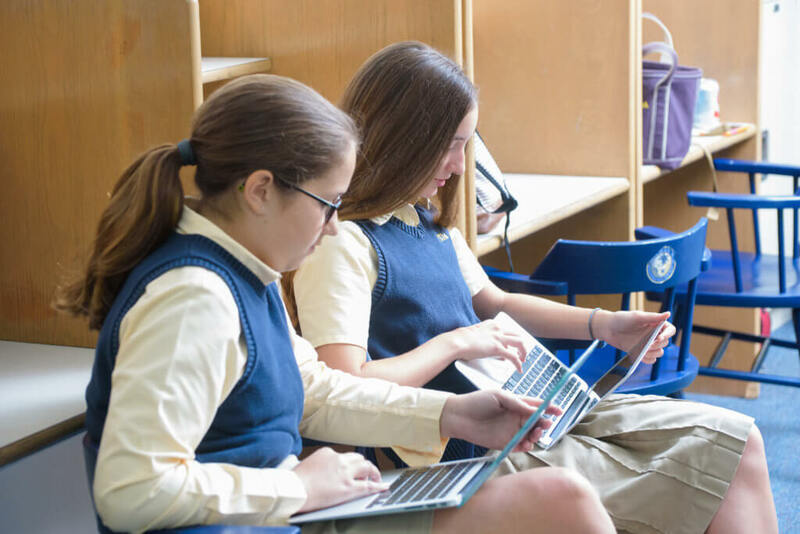 On Upper Campus, students are welcome to bring any laptop or tablet, and beginning in 6th Grade a student must bring their own device. The use of these devices, as with any personally owned device, is strictly up to each teacher. Smartphones may have a place in some classrooms, but they’re not considered a device for the purposes of the program. When choosing a device, please keep in mind that the majority of our students and all of our faculty use Apple devices, and as such Apple MacBooks or iPads tend be the most effective fit. Laptops typically allow a student to be more productive in creating documents, presentations, movies or other digital media, but ultimately, it is up to the student and their family to choose which device is the best for them. Schools should play a role in teaching students to use technology appropriately. Rather than banning the devices that students use in their daily lives, PBDA teachers guide them in developing the skills needed to be productive digital citizens. Students who cannot access the PBDA network or who may have technical issues with their technology tools need to take care of this issue outside of the classroom. It is the responsibility of the student to bring their device to school fully charged and supply their own chargers. Although every attempt will be made to familiarize students with all technology needed during school, it is the responsibility of each student to follow through and use all technology properly according to the Electronic Device Policy. Students have the ability to print from their personal devices. This is a privilege, and students must ask a teacher’s permission before printing. At Palm Beach Day Academy, we value sportsmanship as much as scholarship, and athletes of every ability succeed here.